This Dribbble give-away is for three Pro Account upgrades, and is not to be confused as a regular Dribbble sign-up or drafting. You must already be a drafted member of Dribbble in order to participate. 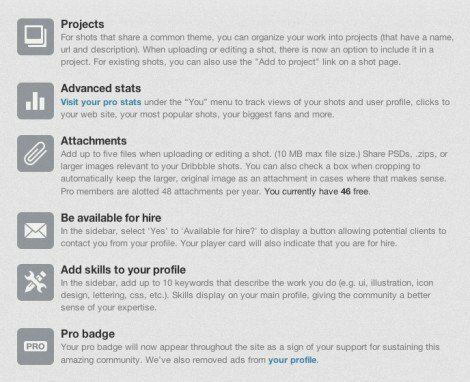 The Dribbble Pro account, worth $19 for one year, gives you a number of added benefits such as: project organisation, stats, attachments for each dribbble, available for hire sign, add skills and pro badge, which definitely come in handy if you are a prolific dribbbler. I’m not a prolific dribbbler, but I do find having the Pro Account well worth the nominal yearly fee. In order to stand a chance of getting one of these three Pro Account Upgrades please just leave a comment below along with your Dribbble profile URL. The three winners will be picked out at random and notified by email with payment for the Dribbble Pro Account to be made via Paypal. You must already be a drafted member of Dribbble, and not a prospect. You must have a PayPal account in order to receive the $19 payment from myself as there are currently no gifting options for the pro account. Leave comment with email or Twitter ID so that I can contact you if you are picked out.